AN exciting new event on the Artsreach circuit, Bristol-based Minima brings Phantom of the Opera to Gillingham School on Thursday 14th February. 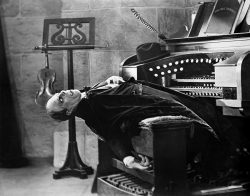 Described as “a spellbinding and immersive screening” the event combines the classic 1925 silent film with live music. Beneath the sewers of the Paris Opera House dwells the Phantom, a hideously disfigured composer who dreams of turning the chorus singer Christine into a diva. With his ghastly make-up and outrageous performance in the title role, Lon Chaney, known as the “Man of a Thousand Faces,” dominates in this adaptation of Gaston Leroux’s 1916 novel. Fast moving and exciting, it is a dramatic tale of obsession, kidnap, murder and revenge, beautifully tinted throughout and featuring an impressive sequence of early Technicolor as the Phantom appears at a masked ball. 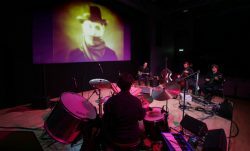 Minima has specialised in live accompaniment to screenings of silent films since 2006. The company has performed at venues including the Barbican Centre, BFI Southbank, Glastonbury Festival and the Transylvania International Film Festival, and has recorded original music for short films by contemporary filmmakers. The electrifying score for The Phantom of the Opera captures the horror of the story, but also finds pathos, romance, and humour. Drums, bass, guitar, cello, mandolin, dulcimer, synthesizer and glockenspiel strike up a thrilling relationship with the film, following the Phantom through his suburban nightmare world and creating a unique live experience. Posted in I Got Music, Moving Pictures on 2 February, 2019 .